Although primary (“baby”) teeth have a lifespan of only a few years, they’re still important to a child’s current and future dental health. In the present, they help a child eat, speak and smile properly. They also help create a healthy future as placeholders for developing permanent teeth yet to come in. If, however, a child loses a primary tooth prematurely due to decay, the corresponding permanent tooth could come in misaligned. That’s why we do what we can to help a decayed primary tooth reach its full lifespan. And there are different ways to do this depending on the type of tooth. With front teeth, which don’t encounter the same chewing forces as those in the back, we may use a tooth-colored filling. This approach is also preferable for appearance’s sake since front teeth are highly visible when a child speaks or smiles. Primary molars, on the other hand, need a more robust solution. A filling may not be able to withstand the level of long-term chewing forces that these back teeth normally encounter. And because they’re less visible than front teeth, there’s less concern about aesthetics. That’s why many pediatric dentists prefer stainless steel crowns for molars. Just like their permanent teeth counterparts, a primary crown fits over and completely covers a tooth. They’re typically pre-formed, coming in different shapes and sizes that can then be customized for the tooth in question. After preparing and removing any decayed material from the tooth, we can usually install the crown in one visit with local anesthesia and a sedative (if the child needs it for anxiety). While a steel crown isn’t the most attractive restoration, it typically handles the higher chewing forces in the back of the mouth better and longer than a filling. That’s especially critical for primary molars, which are some of the last teeth to fall out (as late as ages 10-12). And besides preserving it as a permanent tooth placeholder, a crown also helps the tooth function effectively in the present. 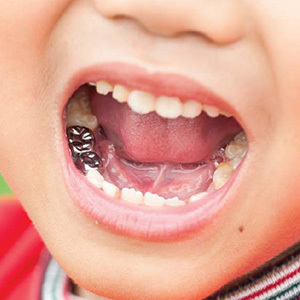 Regardless of what method we use, though, preserving primary teeth is a primary goal of pediatric dentistry. And with a stainless steel crown, we can keep those important back molars functioning for as long as they’re intended.